I feel like it’s been ages since I last made a floral card and truth be told, I’ve kind of missed that. I was looking through some of my old projects the other day, I often do this for inspiration, and I came across some flower cards I made for Altenew years ago when I was on their design them and I felt so inspired to create a floral card again! 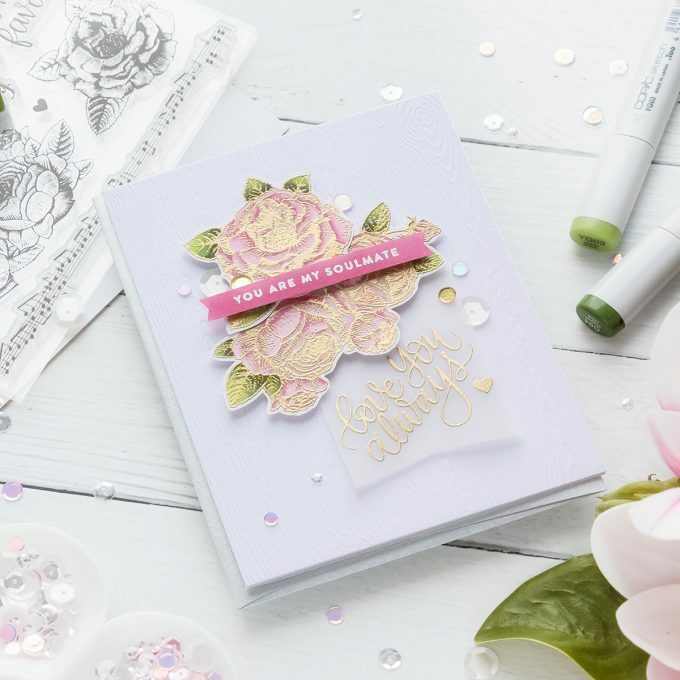 Luckily my Simon Says Stamp February Card Kit had just arrived in the mail and I found absolutely gorgeous stamp set with beautiful roses inside. Needless to say I started working on a card right away! 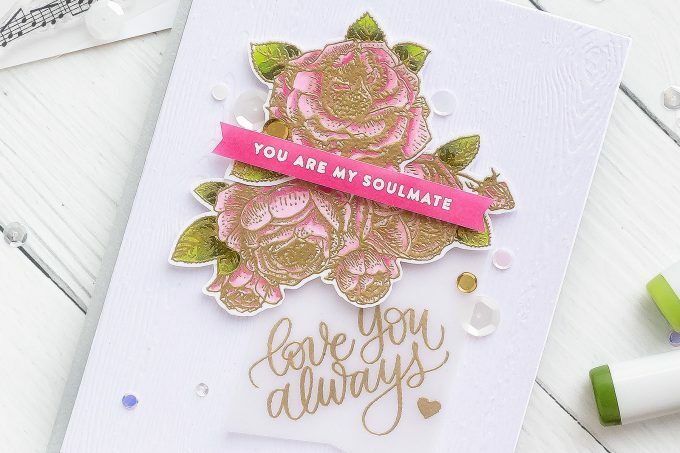 I started working on my card by stamping one of the rose images, a single rose, in Simon Says Stamp clear embossing ink on white cardstock and gold heat embossed it. My plan here was to color this image using Copic markers. It’s not really recommended to color with alcohol markers over heat embossing as that can dissolve embossing powder and damage the tip of your marker, but if you are careful and apply just a little bit of color and don’t do much blending you should be fine. I picked G99, G94 and YG03 colors to color the leaves green. I’ve been doing non traditional color combinations for so long I’ve kind of missed coloring flowers in the traditional ways with the leaves actually being green and not teal or some other unusual color. 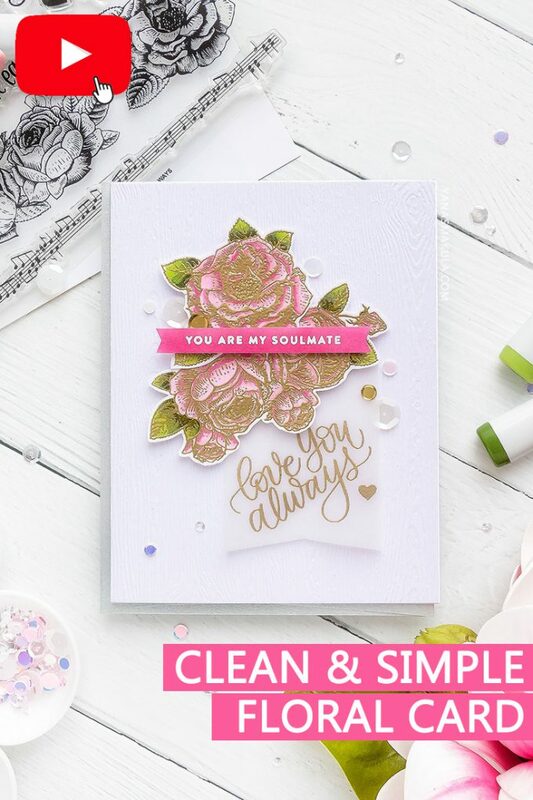 If you’ve been a follower of mine for at least a year time you might remember something I call “Perfect Cardmaking Formula”, it’s a little card recipe, if you will, to create simple yet beautiful cards that look effortless. And the formula, basically involves using a pretty flower, a beautiful skinny strip sentiment and some sort of specialty paper in the background. This is the formula I used today for this card. For the flower I went with new-to-me pink combo – RV34, RV11 and RV10. I love this softer, more natural pink color combination as opposed to using one with RV14, RV13 markers. It’s a more muted and softer pink. There aren’t coordinating dies for this flower, at least not at the moment, so I used my scissors from Tonic Studios and carefully cut the image out. Not my favorite thing to do, but sometimes you just have to. 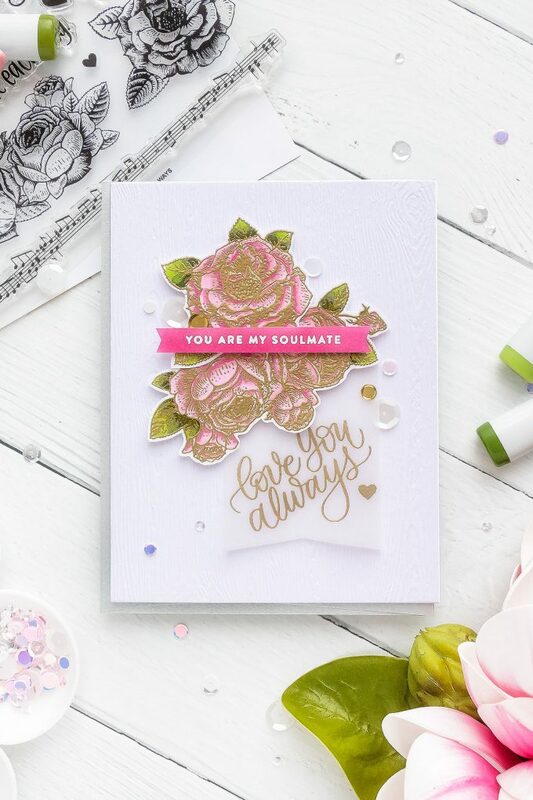 I also stamped, colored and cut out another image – a rose cluster to also use for this card. To create a sentiment I gold heat embossed “Love You Always” on vellum. I would have heat embossed it on the background panel, but since I picked one that has woodgrain texture, I decided not to. I prefer to never stamp and emboss or color or anything like that or textured cardstock as the texture will prevent you from having good results. I also colored a piece of cardstock using the RV34 marker to create colored cardstock to match my card. I white heat embossed “You Are My Soulmate” in and trimmed it into a skinny strip. 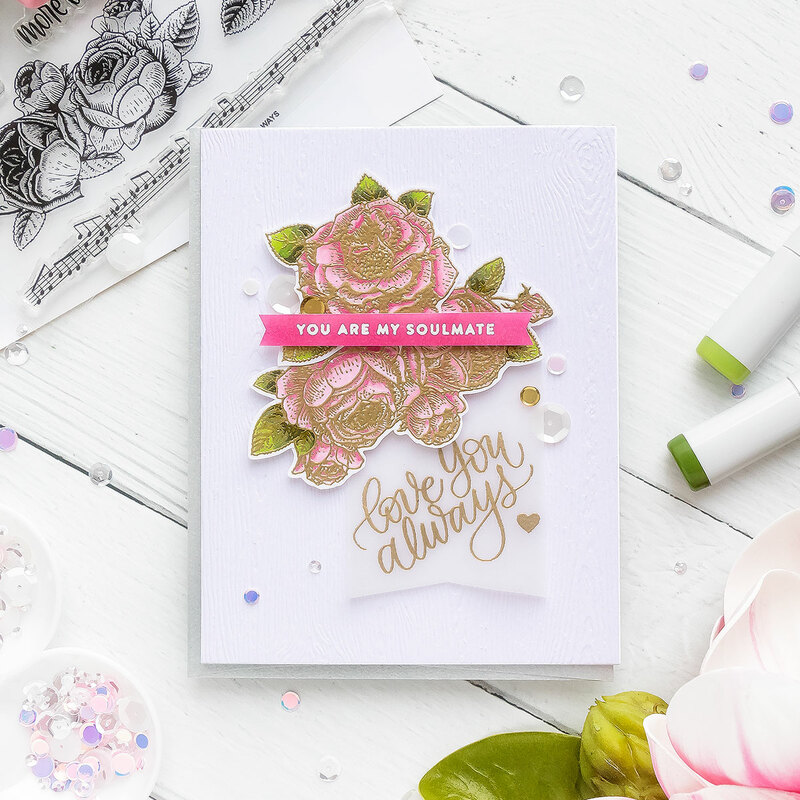 Using Copic markers or the coloring medium you used to color your image with is the best way to create custom colored cardstock for your projects. You can’t really have all of the colors of cardstock in your stash so it’s useful to create your own for little strips like this. The next part, believe it or not, actually took me the longest as I was fussing around with image placement. I foam mounted the florals overlapping my velum panel and foam mounted the sentiment strip on top. Finally, I embellished my card with sequins from 3 sets from Simon – Girls Best Friend, Birthday Cake and Stay Gold. How stunning is THIS??? OH MY GOODNESS! I am inspired beyond words Yana, thank you! Absolutely stunning. 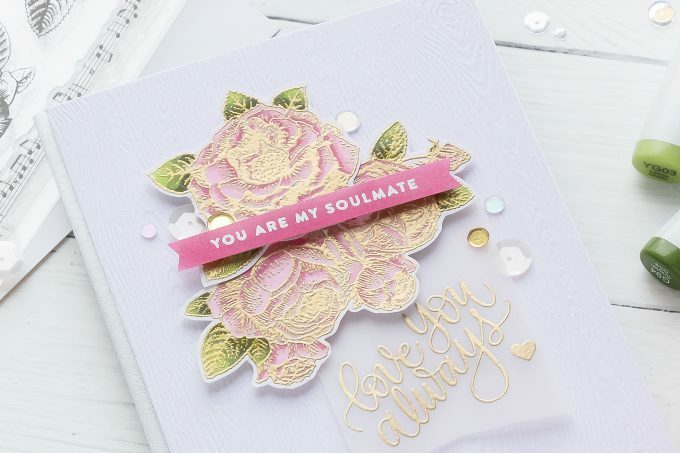 The pink and gold embossing are perfect together, and the vellum sentiment is perfect. Wow, Yana, another stunning floral card. The sentiment embossed in gold on vellum is a gorgeous touch.